I’ll be co-hosting this event! Come hear Wanona Satcher speak. Wanona Satcher is CEO/Founder of Mākhers Studio, LLC a for-profit social enterprise design-build firm, and ReJuve a nonprofit dedicated to developing what she calls “prosilient communities.” Over the course of her career she’s served as an urban designer with a focus on equitable housing policy, landscape architect designer, city planner, economic developer, art curator and theater producer. Wanona holds Economic Development and Finance Professional Certification from the National Development Council in small business development and real estate development. You are invited to an afternoon tea benefiting The Foster Care Alliance. The event will take place April 27, 2019 at 2:30pm.at Bellmere Gardens in Johns Creek, GA. It will be emceed by Amena Brown. Silent Auction will begin at 2:30 pm. Tea will be served promptly at 3:00pm. Please RSVP by April 20th to reserve your spot. The Voices Conference is a two-day event providing leadership development and a platform for leaders of color. The Voices Conference hopes to empower and unite leaders of color in a way that gives voice to their own history and experiences. The conference experience is created by leaders of color for leaders of color. Support neighboring to end homelessness by sponsoring or attending the Bridge Of Hope National Gala. This year the Gala features spoken word poet and author Amena Brown sharing about Finding Home. The luncheon fundraiser will include an update about Bridge of Hope and how we can end homelessness for women and children. Amena Brown and her husband DJ Opdiggy are bringing their unique style of music, poetry and event curation to Portland, Oregon in partnership with UMC NW! 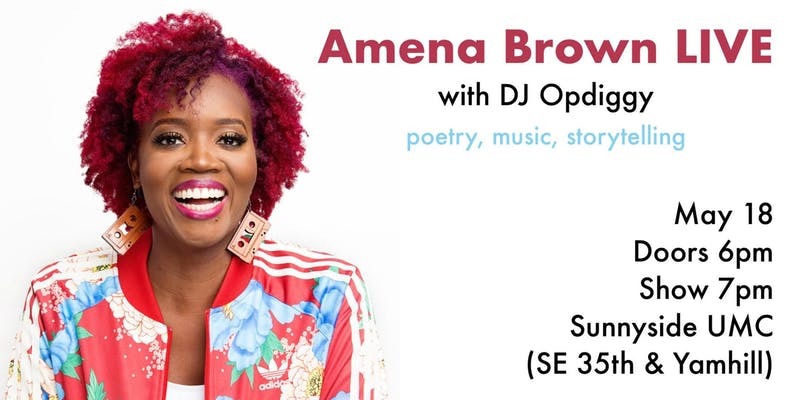 Spoken word poet and author, Amena Brown, will perform a night of poetry and storytelling, including a reading from her latest non-fiction book, How to Fix a Broken Record. DJ Opdiggy will spin amazing tunes which may even cause a dance party after the show. From learning to love her big feet and natural hair, to bad dating stories and learning how to properly adult, Amena's performance will speak of home, surrender and searching for the groove while leaving the audience room to laugh, lament, and dance as they contemplate their own broken records. Proceeds will benefit Africa New Life Ministries. A gathering for wanderers, wonderers, and spiritual refugees to help you discover...You are not alone. Are you sorting through your faith, trying to figure out what you believe now? Do you feel as if you are in the wilderness, unable to find your way forward spiritually? Have you had your safe and tidy answers upended by life? Do you feel like you don't belong in your church or tradition anymore? Do you want to better reimagine the role of scripture and theology? Are you searching for answers at the intersection of faith and sexuality? Justice? Scripture? Church? Do you wonder if there is still room for you in the Church? Are you at a loss as to how to act justly and love mercy in this world? Do you want to begin to reimagine, rebuild, and resurrect a faith worth living? Evolving Faith is a gathering of kindred spirits, an opportunity to learn, wrestle, worship, laugh, and commiserate as we navigate this journey through the wilderness together. 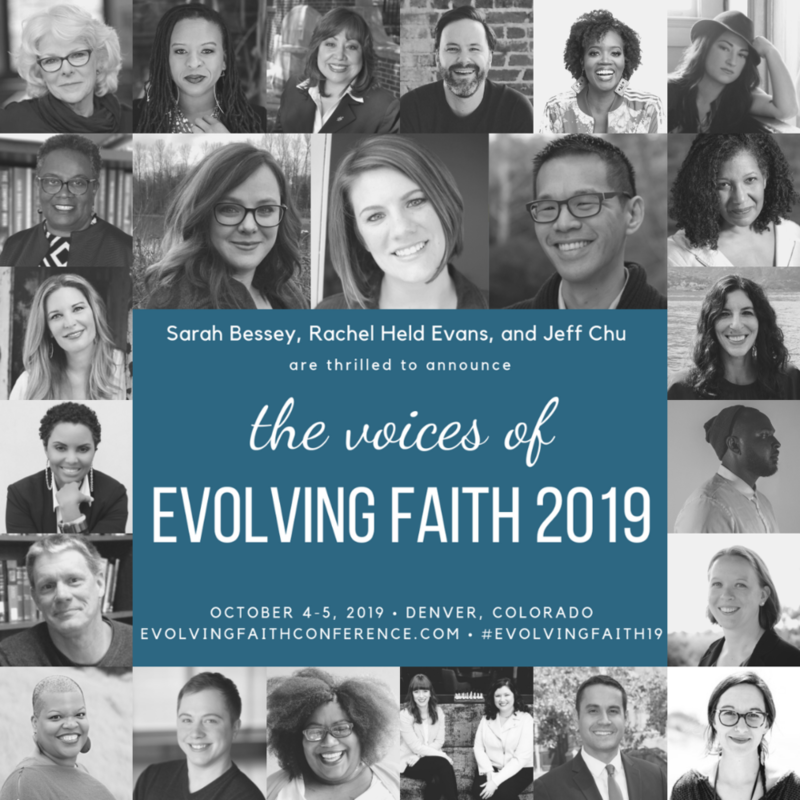 Join Rachel Held Evans, Sarah Bessey, Jeff Chu, and an extraordinary line-up of speakers (to be announced on April 15, 2019) in conversations around everything from the Bible to politics to justice to human dignity and much more. So come as you are! Doubters and dreamers, parents and singles, pastors and church drop-outs, LGBTQ friends and Bible nerds, post-evangelicals and “happy-clappy” Pentecostals—all are welcome at the Table. We hope you will leave feeling a little more inspired and a little less alone.